Cherokee Lake has nearly 400 miles of winding shoreline and about 28,780 acres of water surface. The dam is 175 feet high and stretches 6,760 feet, or well over a mile, from one end to the other. There are restrooms with heated showers and flush toilets, dump station, children’s play equipment, picnic tables and grills, swimming beach, boat ramps above dam and below dam, lake and river fishing, paved walking trail, and bird-watching. Amenities: one electrical outlet with two plug-ins, there is no lighting under the pavilion, 10 tables that will seat 50 people, one large charcoal grill, handicap accessible, restrooms nearby (about 1100 feet), near the beach area and boat ramp, paved parking lot, water is furnished, there are horseshoes and stakes, no other equipment for activities such as volleyball, badminton, etc. Douglas Lake provides 513 miles of shoreline and about 28,420 acres of water surface for recreation activities. The headwater campground provides restrooms with heated showers and flush toilets, dump station, picnic tables, swimming beach, boat ramp, walking trail, wildlife viewing area, and bird-watching. 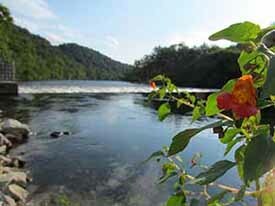 Trotter Bluff Small Wild Area features walking trails through 30 acres of mature hardwood forest, limestone sinkholes, spring wildflowers and vistas of the dam and tailwaters. The Douglas Dam Tailwater Campground provides restrooms with heated showers and flush toilets, dump station, children’s play equipment, picnic tables and grills, boat ramp, river fishing with fishing pier, bait and tackle shop, wildlife viewing area, and bird-watching. Amenities: one electrical outlet with two plug-ins, no lighting under the pavilion but there is lighting on the outside of pavilion, 10 tables that will seat 60 people and there is stadium seating outside the pavilion that will seat 200, one large covered charcoal grill and one large uncovered grill, handicapped-accessible, restrooms nearby (about 300 feet), not near the beach area or boat ramp, paved parking lot, water is furnished, and there is no equipment for activities such as horseshoes, volleyball, etc. 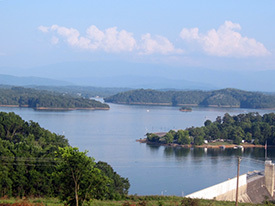 Fort Loudoun Reservoir has 379 miles of shoreline and 14,600 acres of water surface. It has a flood-storage capacity of 111,000 acre-feet. 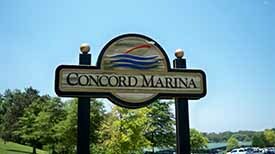 Restrooms with heated showers and flush toilets, dump station, multipurpose court, picnic tables with grills, swimming beach, boat ramps above and below the dam, lake fishing, bird-watching. Melton Hill Dam Reservation Trail descends 0.9 miles from the dam overlook to the lakeshore through a hardwood forest filled with wildflowers and diverse wildlife. There are 4 group pavilions. Restrooms nearby. Hemlock Bluff National Recreation Trail, named for the prominence of hemlocks in the hardwood forest that the trail traverses, is a seven-mile loop along the steep ridges and bluffs of Norris Reservoir. Group Pavilion Amenities: one electrical outlet with two plug-ins, lighting under the pavilion, six tables that will seat 50 people, one large charcoal grill, handicapped-accessible, restrooms are about one-half mile away, not near the boat ramp, graveled parking lot, no water is furnished, and there is no equipment for activities such as horseshoes, volleyball, etc. Amenities: one electrical outlet with two plug-ins, no lighting under the pavilion, eight tables that will seat 48 people, two charcoal grills, handicapped-accessible, restrooms nearby (about 40 feet), near the beach area and boat ramp, paved parking lot, water is furnished, and there is no equipment for activities such as horseshoes, volleyball, etc. 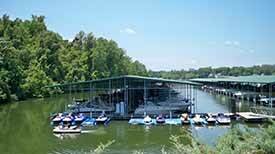 Volunteer Landing Marina is one of the more popular marinas on the Tennessee River. It is located in Downtown Knoxville, just a few minutes from The University of Tennessee campus, Downtown Market square, Gay Street and The Old City Knoxville.